With his new album, Blue Bandana, Brandon Jenkins discarded the normal trappings that come along with a label based album, taking the responsibility himself and releasing it on his newly formed Red Dirt Legend imprint. For the 13th album of his recording career, Jenkins laid down tracks and mixed with his longtime producer Dave Percefull at his Yellow Dog studio in Wimberley over a two-day period. Blue Bandana is comprised of raw, unfiltered tracks and mixes that reflect Jenkins’ unflinching songs and signature vocal, leaving the scars not many artists are prepared to expose when recording. The final product is perhaps his finest to date and gives his fans and newly exposed listeners a unique experience of hearing an album that has been recorded with a live performance attitude capturing the emotion of the artist in his unrestrained creative nature with the flaws and mistakes others try to hide. Known as the “Red Dirt Legend” by his fans and the Red Dirt / Texas Music community, Jenkins is known for his unique songwriting style and musicianship. Throughout his 20 + year music career he has been a mainstay on festival and listening rooms stages throughout the US and Europe, had multiple hits on the influential Texas Music Radio Charts and written hits for others. 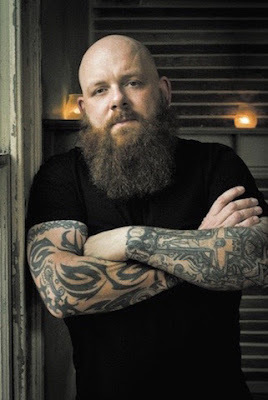 Beginning his career as a fresh-faced kid in his hometown of Tulsa, Oklahoma in 1994 to being the bearded, tattooed man currently residing Austin, Texas, Jenkins has never strayed from writing and singing songs filled with honesty, soul, emotion, and never shied away from facing his own demons when composing songs for himself and others. Penning Red Dirt classics like the hard edged “Finger On The Trigger” to one of the most played and requested love songs “My Feet Don’t Touch The Ground” are testimonies to his diverse songwriting capabilities and recorded performances.